Whitney Vickers | Greene County News Flames engulfed a home July 6 on the 1400 block of Mapleridge Drive. Fairborn Fire Department officials said by the time they arrived, the homeowners were already outside; no injuries or fatalities occurred. Crews battled the flames for at least an hour and a half. A neighbor said he was mowing his yard when he spotted the garage on fire. He called 911 then went to check on the homeowners, where he found them outside preparing to dial. 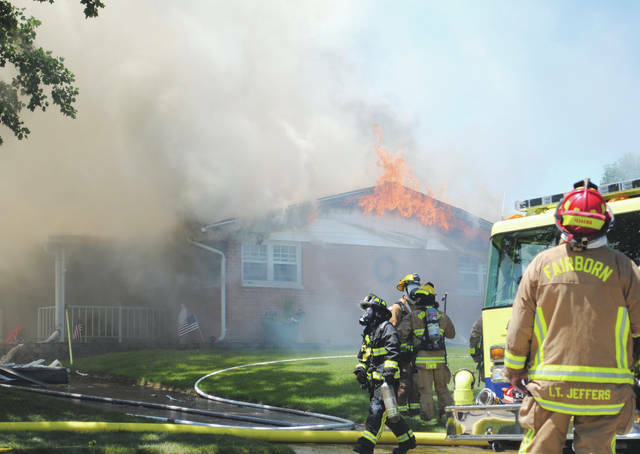 FAIRBORN — Multiple fire crews were called into action July 6 when a home on the 1400 block of Mapleridge Drive went up in flames. By the time crews arrived the homeowners were already outside, according to Fairborn Battalion Chief Patrick Ricketts. No fatalities or injuries occurred. A neighbor said he was mowing his yard when he noticed flames on the attached garage. He said he called 911 and went to check on the homeowners, who were already outside preparing to dial. Ricketts said the cause of the fire is unknown at this time and that they battled the flames for at least an hour and a half. He added that the outdoor temperature and wind made the job more difficult for firefighters. Fire crews from Fairborn, Riverside, Huber Heights and Wright-Patterson Air Force Base each responded to the call. https://www.fairborndailyherald.com/wp-content/uploads/sites/50/2018/07/web1_mfire5.jpgWhitney Vickers | Greene County News Flames engulfed a home July 6 on the 1400 block of Mapleridge Drive. Fairborn Fire Department officials said by the time they arrived, the homeowners were already outside; no injuries or fatalities occurred. 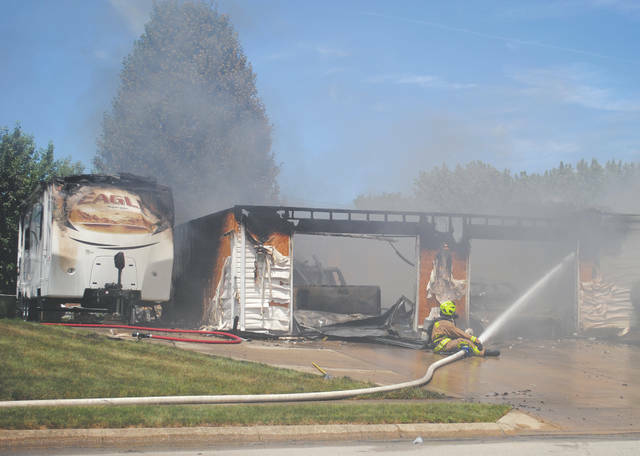 https://www.fairborndailyherald.com/wp-content/uploads/sites/50/2018/07/web1_mfire6.jpgCrews battled the flames for at least an hour and a half. 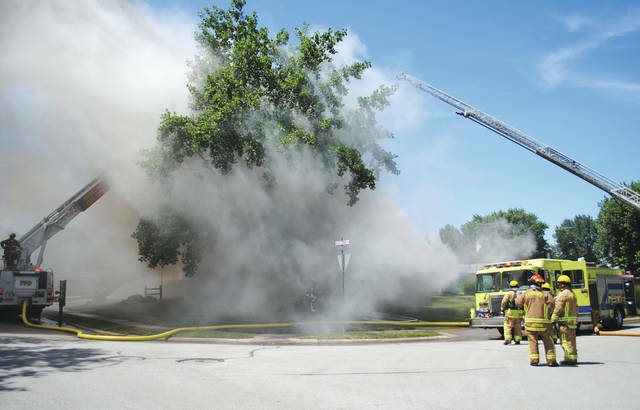 https://www.fairborndailyherald.com/wp-content/uploads/sites/50/2018/07/web1_mfire3.jpgCrews battled the flames for at least an hour and a half. 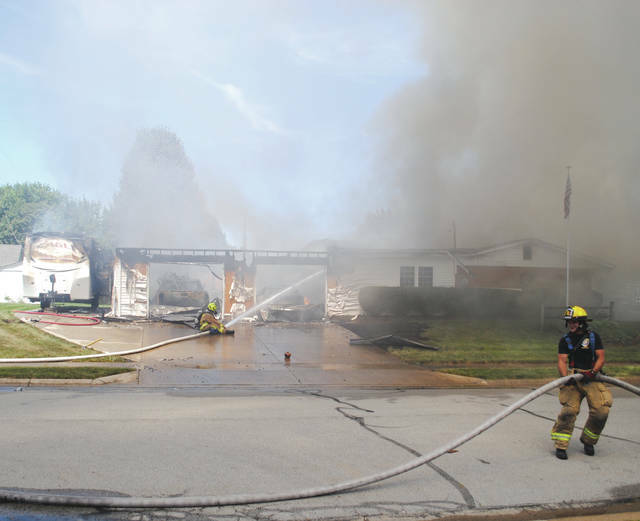 https://www.fairborndailyherald.com/wp-content/uploads/sites/50/2018/07/web1_mfire4.jpgA neighbor said he was mowing his yard when he spotted the garage on fire. He called 911 then went to check on the homeowners, where he found them outside preparing to dial.